Rapunzel is very famous within fashionable society, and shes got a new project to start. Shes going to open the Art Gallery, and she needs some extra help with final preparation. Thats why shes asking her BFFs to help her. The princesses have a great sense of style, and they are going to decorate the Gallery first. Help them choose design of walls, floor and ceiling. Then, put up the pictures right on their spots. When you�ve done with preparations, go to the most exciting part the dress up! 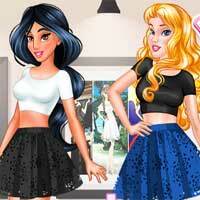 Choose the best outfits for the princesses and dont forget about awesome accessories. Enjoy the grand opening and have fun!